Chris Verlinde hopes the 17th Annual Seagrass Awareness Celebration will help people understand the importance of seagrasses and how they impact coastal health. Throughout the month of March, coastal communities across Florida are observing Seagrass Awareness Month as a means of bringing attention to the importance of seagrass meadows to the ocean’s health. Florida Sea Grant agents are helping spread the word. In the Florida Panhandle, Chris Verlinde, Florida Sea Grant agent with UF/IFAS Extension in Santa Rosa County, is one of the organizers of the 17th Annual Seagrass Awareness Celebration to be held March 18 from 10 a.m. to 2 p.m. EST at Shoreline Park South in Gulf Breeze, Fla. The event is free and open to the public. This year’s activities include live marine life touch tanks, seining, games, crafts, fishing, kayaking, paddle boards and more. Verlinde held the first Seagrass Awareness Celebration in 2001 in partnership with the Northwest Florida Aquatic Preserves. “We started the event to increase awareness of the importance of seagrass beds and teach folks what they could do to protect them,” Verlinde said. Seagrasses also provide food for sea turtles and thousands of other marine species, increase water clarity and improve general water quality. All these elements build a healthy coastal environment, which in turn attracts residents and tourists, boosting the state’s economy. Along the Big Bend of Florida, Savanna Barry, Florida Sea Grant Agent with UF/IFAS Extension for the Nature Coast is educating boaters about the impact of propeller scarring on seagrass. 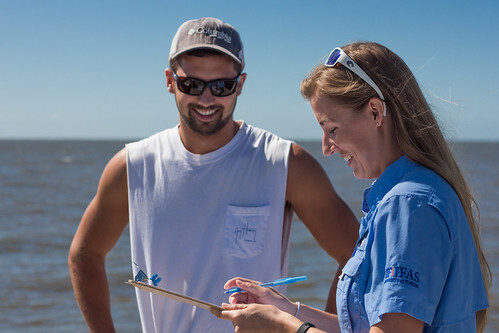 To help teach boaters seagrass safe boating practices, Barry has teamed up with Joy Hazell, Florida Sea Grant Agent with UF/IFAS Extension in Lee County, to launch the “Scars Hurt: Be Seagrass Safe” campaign. An informational website features simple steps boaters can take to avoid scarring seagrass. Attractive signage is now available to be placed at boat ramps around the state. Avoid seagrass beds and use navigation channels or deeper water while under power. Simply remaining aware of your surroundings and being mindful of where you are can go a long way toward protectin. If boating over seagrass beds in shallow water, be sure to trim your motor up and idle to a safe depth before getting on plane. Not only does this prevent seagrass damage, it will also save you costly repairs to props and engine skegs in the process. If you’ve run aground, do not proceed under power. Turn off and trim up your motor, and while wearing protective footwear push the boat to safe depth. There will often be times when avoidance is impossible and trimming is not an option. In these cases pushing your boat helps you avoid both seagrass AND prop/engine damage. A short push is a small price to pay for what you’ll save. Get involved with local organizations that promote nature protection. If you live near water, keep a buffer of plants along your shoreline to reduce runoff pollution from entering bays. This will also help to protect your property from erosion and slow flood waters during storm events. To save money, plant native plants that don’t require lots of fertilizers and pesticides. Avoid seagrass beds when planning for dredging activities or pier construction.